Well, we can answer both of those questions for you. Continue reading to find out more on how Games With Gold works, or scroll down to see the list of hot titles that can be yours for FREE in August. 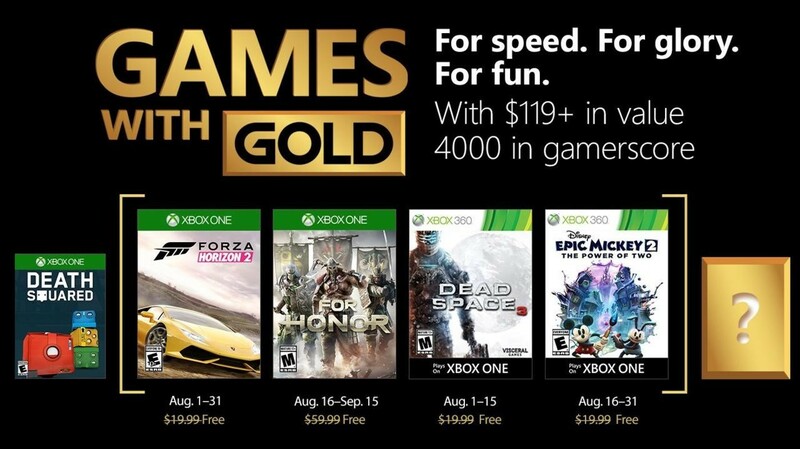 These 4 games are free to keep for Xbox Live Gold members. 1 What is Games With Gold? Not an Xbox Live Gold member yet? No problem. Pick up a one month subscription here for just $13.39, which will give you access to the $120 worth of games below… Yeah it’s a pretty crazy deal. But, keep in mind that amazing games are available for free every single month: Assassin’s Creed: Syndicate, SMITE, and Metal Gear Solid V have all been up for grabs this year. So you’re probably going to want to be a member for longer than one month. A 12 month Gold membership is the best deal, because you get 12 times the games for only slightly more. But we have all different membership card options available in our webstore. Beautiful cars and a beautiful open world environment are the highlight of this award winning racing title. But don’t take your eyes off the road for too long as you try out over 200 different exotic cars in various races and special events. Dynamic weather conditions make both day and night racing more exciting in a detailed world that features almost three times more drivable area than the original Forza. And of course, it features online multiplayer too! Choose your warrior, choose your weapon, and fight for your honor in this fantasy action-fighting game that takes place in a post-apocalyptic medieval setting. There are a lot of medieval action games out there, but not a lot with the awesome combat system that For Honor has– which is good, because there’s lots of slashing and smashing to be done in the exciting campaign mode. But, it’s the multiplayer mode that’s the real star of this brawler. Whether in one-on-one duels, small team fights or in large-scale conquest battles, testing your warrior knowledge against real life opponents will really get your heart pounding. Knight? Samurai? Viking? Who will you be? What fighting style and weapons will you master? And will you let your opponent take your honor? The third title in one of the best survival-horror franchises out there, Dead Space 3 is the exciting conclusion to the trilogy. You don’t need to play the first two titles in the series to enjoy Dead Space 3, however you might want to after you’re done with this spooky thrill ride. Save mankind from an impending undead-alien apocalypse for FREE in August (and keep the game forever with your Gold membership). After Dead Space 3 you might want something a little more… light hearted. Mickey to the rescue! Well not just Mickey, his buddy Oswald the Lucky Rabbit is coming along too as you work to save the magical world of Wasteland with your powerful paintbrush. Along with Oswald’s multiplayer enabled co-op help (and his electric remote control! ), you’ll fight your way through a forgotten world filled with decades of abandoned Disney characters and theme park attractions. You can start your animated action journey to defeat the Mad Doctor for free beginning on August 16th. Follow us on Twitter, Facebook, and Instagram to know more about our deals!